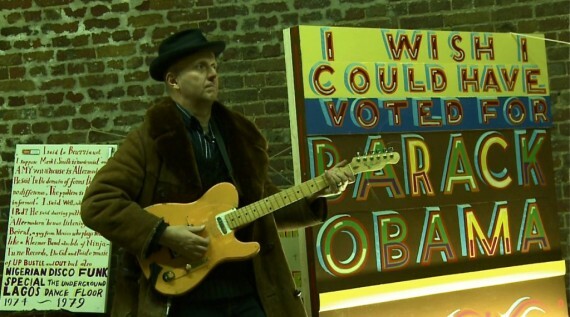 Filmed over three years and premiered at last week’s East London Film Festival, a new film about Bob and Roberta Smith offers a fascinating insight into the life of the artist. Make Your Own Damn Art, a new collaboration between filmmaker John Rogers and artist Bob and Roberta Smith (Patrick Brill), provides a unique insight into the working processes of one of the UK’s key contemporary artists. Filmed predominantly in and around the artist’s studio in Leytonstone and premiered on Friday at the East End Film Festival, the film is an absorbing exploration of the concept of collaboration. The overriding message is that art belongs to everyone and still has an important role to play in society. Rogers explains: “I loved Bob’s punk DIY ethos, his politics and use of humour. I’ve attempted to make the film in the same way. Brill and Rogers met three years ago in the unlikeliest of ways. Spotting a tube poster for the Leytonstone Centre for Contemporary Arts, a quick Google search led Rogers to a shed in the back garden of a house 30 seconds walk away from his own. Rogers’ documentary splendidly captures Brill’s humorous, polemical practice. Never one for reservation, this is an artist committed to art as part of the democratic process. Does Rogers worry about how the film will be received? While the film currently has no distribution deal, Rogers hopes to get it screened at galleries and museums. In the meantime, you can view a short preview clip here.